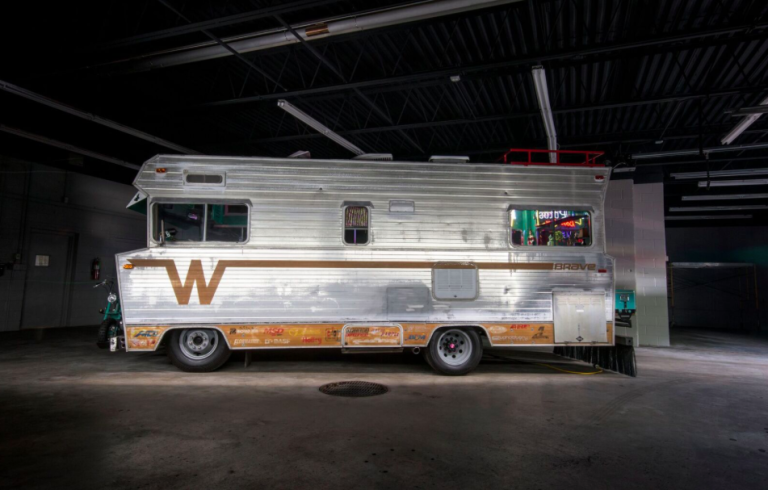 It started out life as a 1972 Winnebago Brave recreational vehicle, but for SEMA, Ringbrothers decided they would turn this mobile home into a stylish cruising machine. Gone is the original engine, and in its place sits a Wegner Motorsports LS 408 supercharged V8 motor, pushing out an absurd 900 horsepower. The transmission is a General Motors 4L80 automatic unit, which sends the torque to a rear end from a 2005 F-550. This is far from your average ’70s camper van. Ringbrothers decided it would keep the exterior modifications to a minimum, opting not to restore or repaint the body, instead slapping on a couple of sponsor decals, along with a neat little detachable motorbike. It’s a timeless look that’s aged nicely, so it would be a shame if they changed it too much. But the interior is where the real fun begins. Almost everything you see has been completely redone, starting with the driver’s section. The metal is covered in a minty green paint, and the gauges are all new. There’s a glass engine cover, so anyone curious enough can actually see the supercharger poking out. 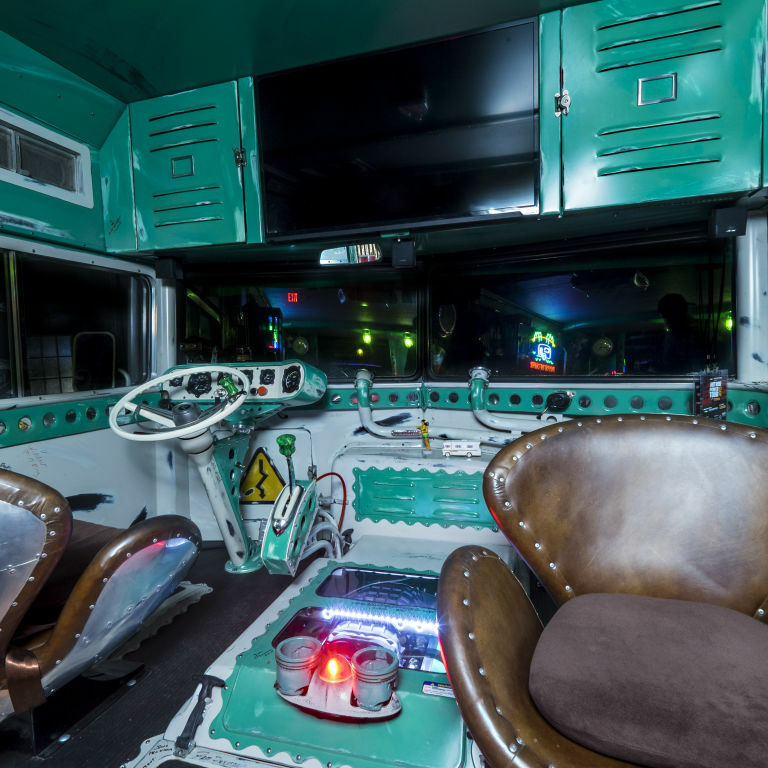 All of the seats are done in leather, accompanied by a makeshift bar at the rear. There’s a boat engine hanging off the wall, as well as a flat screen TV over the windshield. 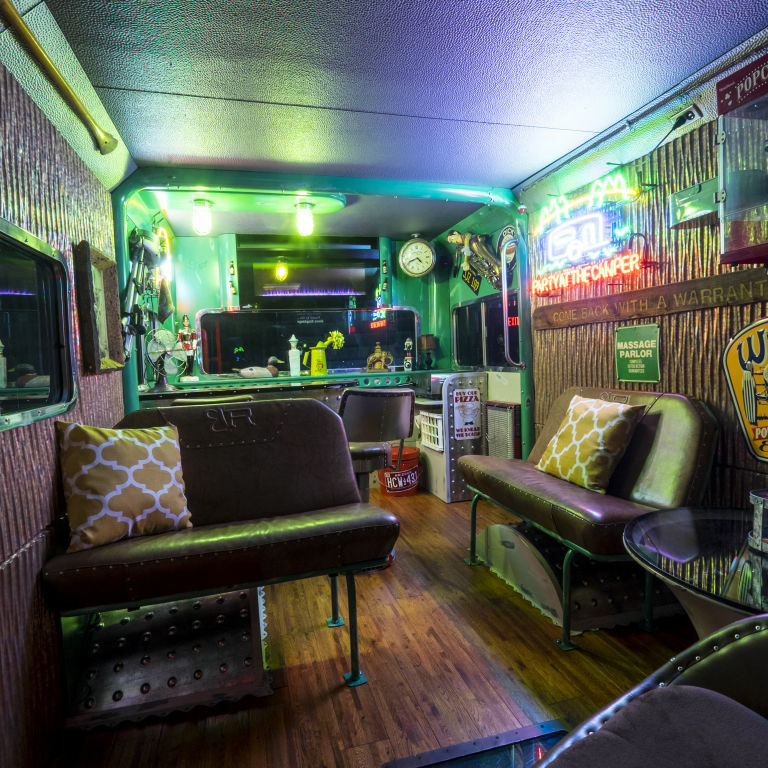 A couple of custom neon lights adorn the cabin, giving off a sweet, chill vibe. This is a place you could spend a lot of time. It might not have the sleeping arrangements necessary for your family road trip, but with all this style, we couldn’t imagine taking anything else on a destination drive.